BrainFPV brings us their latest creation, the Radix Flight PDB. Supporting up to 8S and 160A, the radix PDB (power distribution board) can handle serious power. The integrated LC filter and 5V (2A) regulator provide noise reduction and clean power to the radix FC and other peripherals. 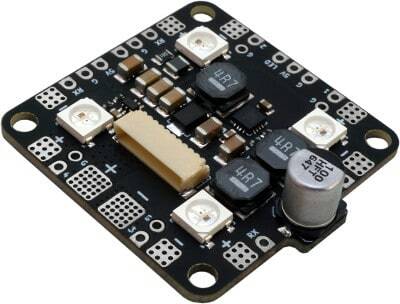 Get the cleanest build by soldering the motor and ESC telemetry signals directly to the radix PDB, and connecting it to the radix FC using the included cable. Oh yeah, did we mention there are four integrated programmable LEDs? PCB: 4 layers, 4oz (170um) copper per layer. HASL plating (lead-free).